A major new Andy Warhol exhibition opens at the Albert Dock’s Tate Gallery, Getintothis’ Laurence Thompson examines the artist’s curious legacy and enduring influence on pop music. Perhaps expressed in less-tactless phrasing, Warhol himself long presented a similar challenge to the intellectual. Gore Vidal, for instance, described him as the only genius he’d ever met with an IQ of 60. And yet, Warhol’s current standing in the early 21st century zeitgeist is elevated. His memory haunts the superposition between omnipresent supercool icon-generator of the past and wry augur-priest of the mass-produced post-modern celeb-cult. His only quotation of note, that one day everybody will have their 15 minutes of fame, is proposed as proof positive not just of his visionary status, but of the influence he yet wields over a media inculcated with reality TV shows and human interest news stories. Furthermore, his work accounts for one sixth of the contemporary art market, testament to his continuing relevance in the medium in which he made his name. Art-world superstars such as Damien Hirst, Richard Prince, Jeff Koons and Keith Haring all cite his influence, where his influence is not already obvious. His sole quotable, the “15 minutes” one-liner, seems a poor, stopped-clock-esque return for a man described by writer and ex-Factory alumni Glenn O’Brien as someone with a natural gift for aphorisms, but that’s still a better score than O’Brien himself. As for his unfortunate role as the architect-prophet of the age of Big Brother, The Only Way Is Essex and North West Tonight, Warhol is one of the few people in history vapid enough to have happily copped to the creation of the nest of horrors the discerning societal participant finds himself surrounded with, so that presents no real knock against him. He was to New York bohemia what Miss Jean Brodie was to fictional Edinburgh junior schools, needing his entourage and all associated trappings as much as they needed him. With his “superstars,” generally disaffected drop-outs, heroin casualties like Emerson, wealthy scene-tourists and other social debris, Warhol delighted in the exaltation of the talentless, the ennoblement of the useless and the apotheosis of crap – except that implies work akin to Serrano’s Piss Christ or Ofili’s The Holy Virgin Mary, two infinitely more thoughtful pieces than anything Warhol was famous for. He was like a multi-platform John Waters with little self-awareness and less stomach for the grotesque, if such a thing can be imagined. So all that remains is: is the work any good? Tate Liverpool is exhibiting over a hundred of Warhol’s artworks, so one can certainly get an idea of his aforementioned fecundity. Perhaps his most famous production, the Marilyn Diptych, is the centrepiece of many works to be gracing the North of England for the first time, so if you’re not going to “get” Warhol from this exhibition, you’re never likely to. This, after all, is the piece that most instantly summarises Warhol’s one message, about the work of art in the age of mechanical reproduction. But asking whether the Diptych, or any of Warhol’s work, is of any quality at all is itself missing the point. In awe of and insanely jealous of his subject in the Diptych, he was all about image, not the skilful creation of images. It was once said of Cézanne that he left it all on the canvas – Warhol left it everywhere but. He was about public relations, publicity and promotion. 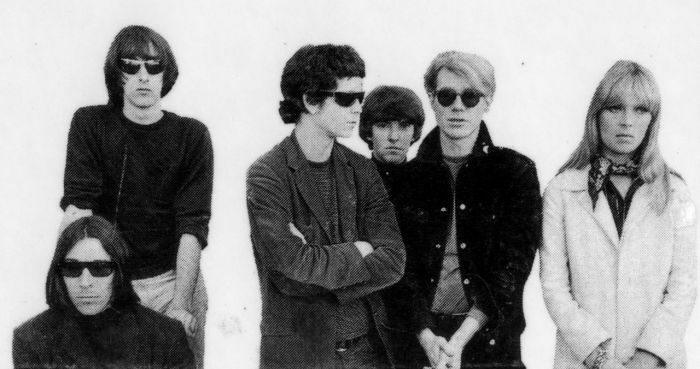 Since we’re used to talking music on Getintothis, we should mention one of those promotions, the prime relevance of Warhol to pop: his association with the Velvet Underground. Through them, we can draw a line from Warhol to punk and post-punk, to Bowie, to glam, to indie, to lo-fi, alternative, experimental and art rock. And indeed, it is through this association that Warhol’s true talent shines through. Though he was too inept a manager to garner the mainstream acclaim he desired for himself and for the band, leaving perhaps the best group of the 60s as the only one almost nobody had heard of, he excelled at whittling himself a niche in the colossus of Reed and Cale’s talent, and was smart enough not to interfere with the music. Though his relationship to the Velvet Underground was roughly that of Tom Parker’s to Elvis crossed with Storm Thorgerson’s to Pink Floyd, his uncanny capacity for latching his image onto big events has meant he is indelibly tied in with the legacy of the Velvet Underground in the popular imagination. This is an important event for the Tate, and for Liverpool. It represents the first incursion of the avant-charade into the city’s cultural conscious since Yoko’s rubbish Skyladders in 2008. It will be irresistible for unsuspecting music curios, upscale scenesters, the city’s hipoisie, and upper middle class student-types who wear scarves on hot days. If you’re not one of these people, it’s strictly for Velvet Underground completists only.